This would probably seem like a shock headline to some, it’s no conspiracy theory though, while we were camped at Loftus Road, Craven Cottage was actually sold, the question is how much did Mo’ keep from us, it all smacked of Clay, Bulstrode and Cabra all over again. 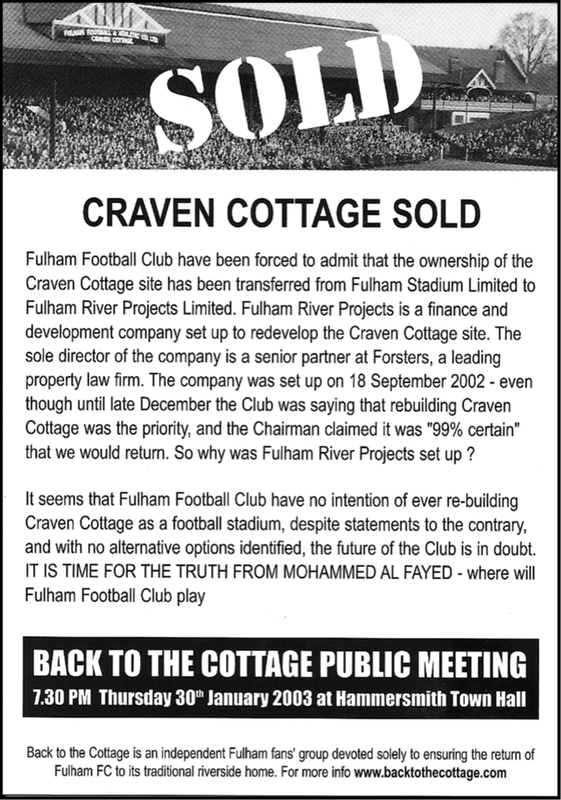 The leaflet on the left was issued by BTTC at the timewhen the club had been forced to vacte the Craven Cottage site as the time had expired following our rise through to the higher Laeagues whereby standing areas were no longer permitted. The idea was that we would re-locate temporarily while a spanking new high-tech stadium would be built in our absence. There we were all looking forward to returning to an elaborately re-furbished stadium, all seater, a vast aray of bars, refreshment and food outlets, escalators, stainless steel and all. The Stevenage Road frontage cleaned up and retained but sadly no Cottage or tree in the corner between the Putney End and Riverside Stand. Then the news broke, first before the close of our first season in Shepherds Bush that there would be a delay before the building works could be started although planning consent had been won after a very drawn out and dirty campaign by NIMBYs. Therefore we would be forced to endure a further season at Loftus Road. We were also told that the cost of the rebuild was in the region of £60m and most materials would be shipped in by river. The Supporters’ Club, which had been granted a long time home in various rooms in the Cottage and which had been in a portacabin at the back of the Hammersmith End for a few seasons, was to have a dedicated permanent space underneath the Hammersmith End Stand. The odd thing was, we were all pretty buoyant, the team was playing decent football and our record at Loftus Road was actually darn good, we were looking forward to returning to what was promised to be one of the best, modern stadia in the UK. and we were settled in the Premier League. HE WASN'T The first either! The next blow to our bubble of false security was the announcement that due to 'various unforeseen developments' (although the most cynical amongst us had foretold this) that we could not re-develop the Craven Cottage site as the costs had risen to £100m rendering the works unsustainable, for costs to be elevated by 70% in a year actually takes some doing. Worse was the news that it would be impossible, untenable, impractical to convert the ground into all seater, obviously Mo’ had brilliant advisers who knew all about building works, football stadia and so on and not a clue about making money, or was it the other way round? We were effectively being told that we would be homeless once our two year deal with QPR expired. All through the Loftus road period, there had been countless rumours, Mo’s intention had all along been to sell the ground and relocate the club elsewhere. One such story was that he was going to buy Loftus Road and ground share QPR and Fulham on a brand new all purpose stadium to be built a derelict site in the Bush, there had been whispers that a ‘mystery benefactor’ had loaned Rangers £10m during our first season over there, this fed that particular theory. The site (said to be owned by Dairy Crest and even the BBC) was not available, some said because the proper planning laws would not allow it because of access and transport problems, it later formed the Westfield retail development. Fortunately, there were enough Fulham fans still fighting to retain the Craven Cottage site amongst them professionals in the sort of construction environment that had knowledge of the specialised nature of sports stadiums, lawyers, and so on. Also worth special mention is the fan who managed to get a preservation order imposed on the plane tree between the Putney and Riverside stands, making it impossible to demolish those entirely and create an integrated stand, a clever way to prevent hasty action. That those well connected fans managed to meet up with the Chairman with the plans they had drawn up which proved beyond doubt that it would be possible to remain and comply with the regulations for an all seater enlarged capacity Cottage. Better still it would be ready for the 2004-2005 season, having been sharong Loftus Road for two seasons, 2002–2003, 2003–2004. One major downside of the mprovements being carried out was the sale of our best striker, Louis Saha, to Manure in order to supplement the required funds for the improvement works. This is sadly a constant theme for Fulham and clubs like them.